ST. LOUIS – The Wild set out on this franchise-record, seven-game road swing wanting to improve its play on the road after it struggled throughout last season. And after already posting four wins during this stretch, the team has a chance to put an exclamation point on its progress so far when it visits the Blues Sunday afternoon for the finale of this trip. 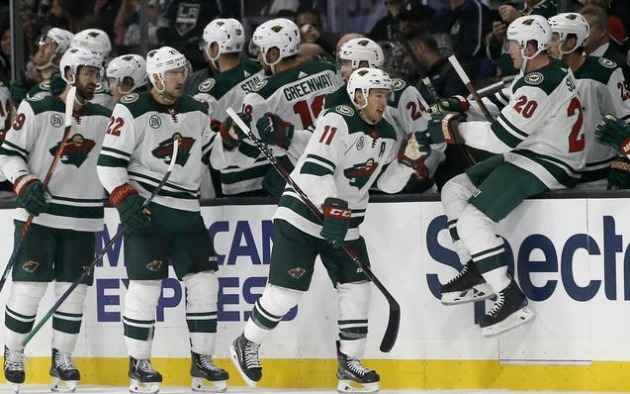 A 4-2 showing has beefed up the Wild’s overall road record to 5-4, as the team boasted just one win away from home before embarking on this trek. Not only has that performance established the group as a competitive road team, but it’s also boosted it up the standings. The Wild is second in the Western Conference at 10-4-2, and its 22 points are tied for third in team history for the most points after 16 games. Since Oct.16, the team has ranked second in the league in wins (nine) and points (18). Its most recent outcome, a 5-1 rout of the Ducks Friday in Anaheim, marked the first time in franchise history in which the Wild recorded four wins on a road trip of five or more games. Another victory Sunday would set a franchise record for wins on a road trip. 198: Career assists for winger Mikael Granlund. 8: Points for Granlund in his last six games. 3: Points for defenseman Nick Seeler last Saturday against the Blues. 6-7-4: The Wild’s record in its last 17 trips to St. Louis. 15: Goals by the Wild’s blue line this season. The Blues have won twice since losing to the Wild last Saturday. They cruised by the Hurricanes 4-1 Tuesday and then blanked the Sharks 4-0 Friday. Goalie Chad Johnson was in net for that game, posting 33 saves. Overall, St. Louis has won four of its last five games. Center Ryan O’Reilly is in the midst of a career-high nine-game point streak.